Every instance of renewal brings joy. Joy is a natural reaction to something new. Rabbi Shimshon Pincus zt'l writes that this is the reason why the Mazel of Adar is fish. 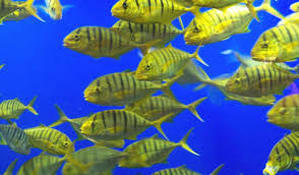 Fish have a unique characteristic that they are the only creatures that propagate in multitudes. According to the calendarical system that the year starts with the month of Nissan, Adar is the last month of the year. At the conclusion of the year there is a feling of yiush, disappointment; a whole year went by and what did I accomplish? The symbolism of the fish at the end year is that one should look ahead at the renewal represented by fish who are fruitful and multiply - this is the epitome of renewal as a new brood of fish are born. The newness inherent in fish, as with every form of renewal should bring to mind feelings of joy and happiness.Thus, Mazel Adar Dagim - fish - the symbol of simcha.